We have chosen 5 upcoming Hybrids & Electric Cars that we feel can help you to transition your fleet to electric. 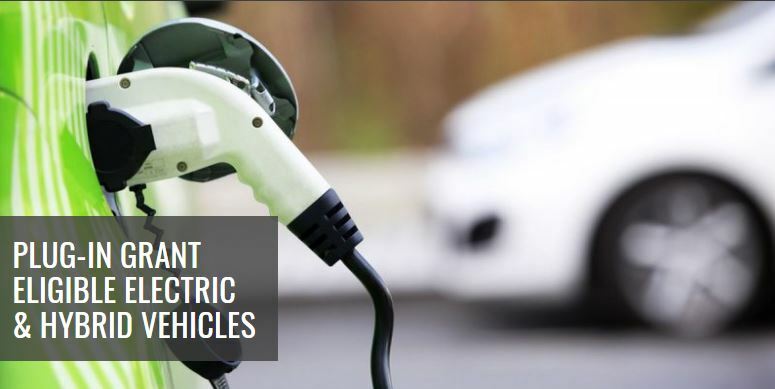 Fully electric and hybrids currently amount to a small proportion of vehicle sales in the UK, but this is set to change rapidly in the coming years. Most of the world’s leading car-makers have announced plans for the extensive electrification of their line-up with manufacturers such as Volvo announcing that they will only sell hybrid and electric vehicles from 2019 and that they expect that fifty percent of their cars to be fully electric by 2025. 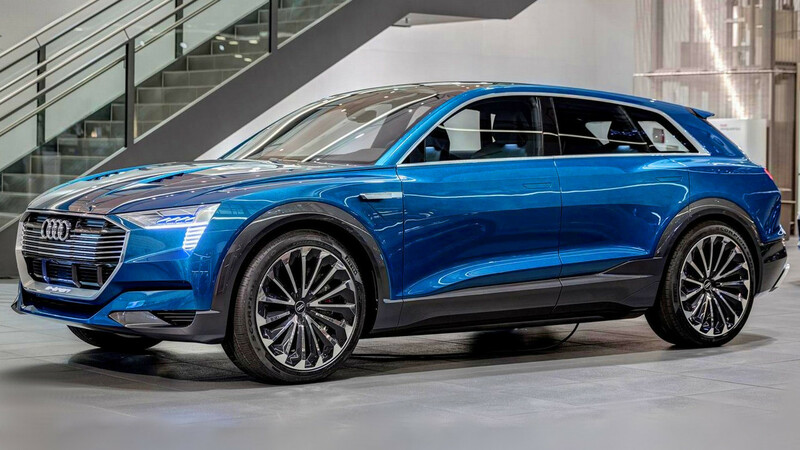 Audi plans to hit the luxury electric marketing rolling with the launch of its E-Tron Quattro SUV due to be revealed on the 17th of September. The E-Tron will feature a dual-motor powertrain using a 95kWh lithium-ion battery with a stated range of 310 miles. The dual-motors will produce a combined power of 350bhp with 414lb/ ft of torque, although a boost mode unlocks the full 402bhp for up to eight seconds, which will accelerate the E-Tron to 0-62mph in just 4.6 seconds. The 95kWh lithium-ion battery can be charged fully at home in 8.5 hours connected to a 400V three-phase outlet. Audi has yet to reveal times for when the car is attached to a regular 230V household plug. Audi has claimed that the E-Tron is capable of 150kW DC fast charging, making it the world first and 30KW faster than what Tesla’s supercharger network can produce. Audi previously revealed details about the E-Tron’s regenerative braking system which it says can recuperate up to 30% of the car’s total range, the car brakes using an electrohydraulic system for quicker responses thanks to the additional pressure of a hydraulic piston. The system, Audi claims, can reduce the braking distance by up to 20%, since there is little delay in getting the brakes applied with full pressure. Based on the latest South Korean brand’s SUV line-up the Hyundai Kona Electric is the first small SUV to be offered fully electric. The Kona will come in two battery options, 39kWh and 64kWh, with the 64kWh already certified for an electric range of 300 miles under the new WLTP test. The 39kWh version of the Kona has an expected cost of £24,995 with a range of 186 miles. The motor will produce 131bhp and will take the Kona to 0-62mph in 9.3Sec. The 64kWh version of the Kona has an expected cost of £29,495, a premium of £4500 over the 39kWh version. It will produce 198bhp and takes 7.6Sec to 0-62mph. Using a standard 7kW home charger you can charge the 39kWh model in six hours with the 64kWh version taking 10 hours. 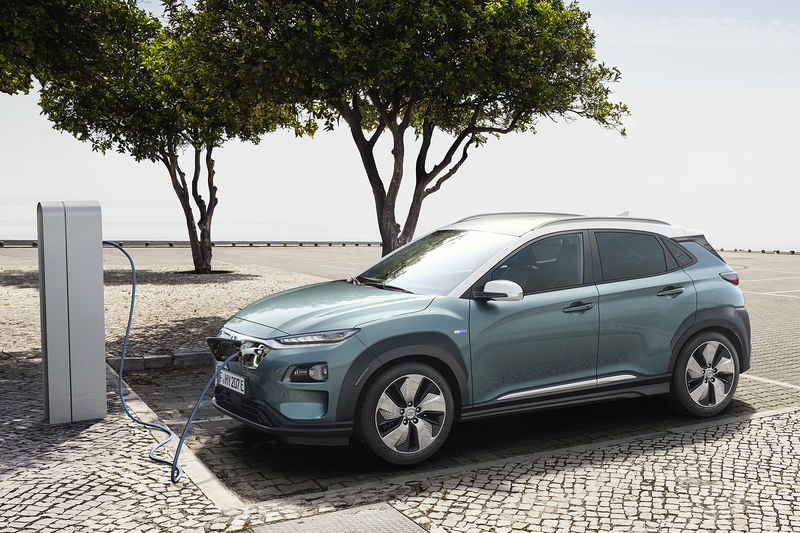 Hyundai states that the Kona can be charged in just 54 minutes using a 100kW charger. These, however, are not publicly available in the UK. All Hyundai Kona Electric models come with automatic emergency braking with pedestrian recognition, lane keep assist and tyre pressure monitoring as standard with Premium and Premium SE models, adding blind spot detection, rear cross traffic alert and lane follow assist to that list. Due to be realised in 2019, the Mini E is likely to use powertrain technology from the BMW i3. Mini has stated that it will bring an agile, ‘go-kart’ like option to the EV market. The Electric Mini is expected to come with a 35kW/hr lithium-ion battery producing 201bhp and taking the Mini to 0-62mph in around 7.5 seconds and offering a range of 186 miles. Mini is undecided whether other variants of the electric hatchback, which will be based on the three-door body shape, will be launched in the first generation of the Electric. Consistency across the brand’s line-up suggests a Cooper model could follow, but Mackensen said finding the balance between performance and range was the first priority. For the production MINI Electric they have carried over some of the details from the concept car, for example features such as the wheels and grille. At the front the hexagonal grille has been filled in to highlight the car’s electric credentials with a yellow accent bar with the firm’s ‘E’ badge emphasising width. The restyled headlights do this too, while sneakily interpreting the firm’s E electric mobility badge. Skoda’s first step into the electric market will be a plug-in version of their very popular Superb. Initial details released by Skoda show that the vehicle will be powered by the 1.4 litre turbocharged petrol engine producing 154bhp and with an added 85kW (114bhp) electric motor the total combined system output of the two motors will be 215bhp. The Superb PHEV will be able to travel around 44 miles on electric power alone power by the 13kWH battery with an expected overall CO2 emissions figure of around 31g/km. 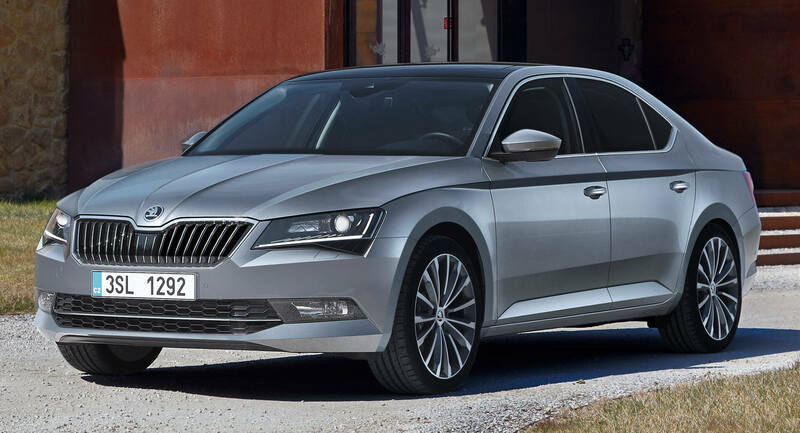 Skoda has announced that the Superb will be one of 20 new Volkswagen Group plug-ins launched by the end of the decade. To move in-line with the V90 and XC90 models, the XC40 is due to be fitted with a plug-in hybrid powertrain by the end of 2019. This plug-in is expected to be powered by a 1.5 litre 3-cylinder petrol engine accompanied by a 9.7 kWh battery and a 55 kW electric motor. The petrol unit provides 178bhp while the electric motor adds 74bhp. Together, they offer a combined 247bhp and 295lb ft of torque. The XC40 PHEV is expected to get 31 miles of all-electric range, which should relate to around 25 miles in a real-world cycle. Three main drive modes will be available with the T5 model: Hybrid, Power and Pure. The first will work too most efficiently combine both parts of the powertrain, the powertrain will maximise the output of both. The final will harness only the electric motor. Individual and Off road modes are also featured, with the former allowing customisation of how the powertrain works and the latter focused on providing maximum traction in low-grip scenarios.